"There is a rose blooming here, after all." Genevieve started when she heard Dylan's musical Welsh voice. She stood as he came through the gate. His untamed hair moved gently in the chilly breeze. He did not look cold, although he wore no cloak. He was clad in an open-necked shirt beneath a leather tunic girded by a thick sword belt. The tunic brushed his muscular thighs, which were encased in breeches. Fur wrappings covered his shins and boots. Plain clothing indeed, and yet he looked absolutely splendid. She did not think a prince could look finer, especially when he regarded her with that intimate smile and those shining eyes. "I was afraid you would not come," he said as he approached her. "I should not, perhaps, have done so." "I would have been very sad." She risked a glance at him. "Truly?" "Most truly. Come, sit here beside me." He sat on the stone bench. Her heart throbbing so that she was sure he must be able to hear it, she hesitated a moment, then joined him, sitting as far away as possible. She was a lady, and there were certain proprieties to be observed. But not by him, apparently, for he boldly reached out and took her gloved hand in his. She knew she should not allow such familiarity, but the words of protest would not come. "Baron DeLanyea tells me you are to leave tomorrow," he said softly. "I will be very sorry when you go." Emboldened by his manner and his words, she looked at him. "So will I. I know my marriage to Lord Kirkheathe pleases my uncle, yet I wish I were not betrothed." When Dylan answered, he sounded as sad as she felt, and his hand squeezed here. "But you are." "Is there nothing to be done?" "I fear there is not, my lady. We must say our farewells. Let us do so here, where we can be alone." Her eyes welled with tears. "I do not want to say farewell." "Then do not," he whispered, bending his head to kiss her. For a fleeing instant, it crossed Genevieve's mind that she should not allow such a liberty. Yet she could not stop him, or herself. She wrapped her arms around him and leaned against him as she lost herself in the wonderful sensations his lips engendered. This is the tenth book in Margaret's Warrior Series. 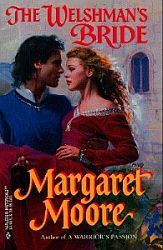 However, Margaret always writes each book to "stand alone" so if you haven't read any of the previous books in the series, you shouldn't feel lost. Permission to reproduce text granted by Harlequin Books S.A. Cover art used by arrangement with Harlequin Enterprises Limited. All rights reserved. ® and TM are trademarks of Harlequin Enterprises Limited and/or its affiliated companies, used under license.